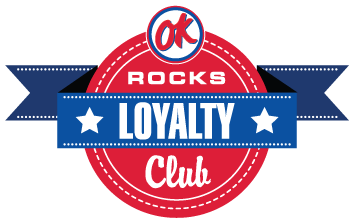 You’re a small step away from membership of the OK Rocks Loyalty Club and your own 15% discount card. A few days after you have completed this form, you’ll receive a Welcome email which you will need to PRINT OFF and take into your nearest diner to exchange it for your 15% card. Then occasionally, we’ll email you with an exclusive offer, breaking news or something else we think you may like. Make sure you add OK Rocks Club to your approved sender list so that you receive all of our offers and they don’t end up blocked by your spam filters.